The BBC World Service, the world's largest international broadcaster, broadcasts radio and television news, speech and discussions in more than 40 languages to many parts of the world on analogue and digital shortwave platforms, Internet streaming, podcasting, satellite, DAB, FM and MW relays. In November 2016 the BBC announced again that it would start broadcasting in additional languages including Amharic and Igbo, in its biggest expansion since the 1940s. In 2015 World Service reached an average of 210 million people a week (via TV, radio and online). The English-language service broadcasts 24 hours a day. The World Service is funded by the United Kingdom's television licence fee, limited advertising and the profits of BBC Worldwide Ltd. The service is also guaranteed £289 million (allocated over a five-year period ending in 2020) from the UK government. The World Service was funded for decades by grant-in-aid through the Foreign and Commonwealth Office of the British Government until 1 April 2014. 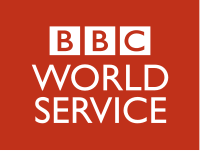 BBC World Service English maintains eight different regional feeds with several program variations, covering, respectively, East and South Africa; West and Central Africa; Europe and Middle East; Americas and Caribbean; East Asia; South Asia; Australasia; United Kingdom. There are also two separate online-only streams with one being more news-oriented, known as News Internet. The controller of BBC World Service English is Mary Hockaday. "Don't expect too much in the early days; for some time we shall transmit comparatively simple programmes, to give the best chance of intelligible reception and provide evidence as to the type of material most suitable for the service in each zone. The programmes will neither be very interesting nor very good." This address was read out five times as the BBC broadcast it live to different parts of the world. On 3 January 1938 the first foreign-language service was launched - in Arabic. Programmes in German started on 29 March 1938, and by the end of 1942 the BBC had started broadcasts in all major European languages. As a result, the Empire Service was renamed[by whom?] the BBC Overseas Service in November 1939, supplemented by the addition of a dedicated BBC European Service from 1941. Funding for these services - known administratively as the External Services of the BBC - came not from the domestic licence-fee but from government grant-in-aid (from the Foreign Office budget). The External Services broadcast propaganda during the Second World War of 1939-1945. Its French service Radio Londres also sent coded messages to the French Resistance. George Orwell broadcast many news bulletins on the Eastern Service during World War II. By the end of the 1940s the number of broadcast languages had expanded and reception had improved, following the opening of a relay in modern-day Malaysia and of the Limassol relay in Cyprus in 1957. On 1 May 1965 the service took its current name of BBC World Service. It expanded its reach with the opening of the Ascension Island relay in 1966, serving African audiences with a stronger signal and better reception, and with the later relay on the Island of Masirah in Oman. In August 1985 the service went off-air for the first time when workers went on strike in protest at the British government's decision to ban a documentary featuring an interview with Martin McGuinness of Sinn Féin. Subsequently, financial pressures decreased the number and the types of services offered by the BBC. Audiences in countries with wide access to Internet services have less need for terrestrial radio. Broadcasts in German ended in March 1999, after research showed that the majority of German listeners tuned into the English-language service. Broadcasts in Dutch, Finnish, French, Hebrew, Italian, Japanese and Malay stopped for similar reasons. On 25 October 2005, the BBC announced that broadcasts in Bulgarian, Croatian, Czech, Greek, Hungarian, Kazakh, Polish, Slovak, Slovene and Thai would end by March 2006, to finance the launch in 2007 of television news-services in Arabic and Persian. Additionally, Romanian broadcasts ceased on 1 August 2008. In January 2011 the closure of the Albanian, Macedonian, Portuguese for Africa, Serbian, and English for the Caribbean services was announced. [by whom?] This reflected the financial situation the Corporation faced following transfer of responsibility for the Service from the Foreign Office, so that it would in future have been funded from within licence-fee income. The Russian, Ukrainian, Mandarin Chinese, Turkish, Vietnamese, Azeri, and Spanish for Cuba services ceased radio broadcasting, and the Hindi, Indonesian, Kyrgyz, Nepali, Swahili, Kinyarwanda and Kirundi services ceased shortwave transmissions. The British government announced that the three Balkan countries[which?] had wide access to international information, and so broadcasts in the local languages had become unnecessary. 650 jobs went as part of the 16% budget cut. The Service broadcasts from Broadcasting House in London, which is also headquarters of the Corporation. It is located in the newer parts of the building, which contains radio and television studios for use by the various language services. The building also contains an integrated newsroom used by the international World Service, the international television channel BBC World News, the domestic television and radio BBC News bulletins, the BBC News Channel and BBC Online. At its launch, the Service was located along with most radio output in Broadcasting House. However, following the explosion of a parachute mine nearby on 8 December 1940, it relocated to premises away from the likely target of Broadcasting House. The Overseas service relocated to Oxford Street while the European service moved temporarily to the emergency broadcasting facilities at Maida Vale Studios. The European services moved permanently into Bush House towards the end of 1940, completing the move in 1941, with the Overseas services joining them in 1958. Bush House subsequently became the home of the BBC World Service and the building itself has gained a global reputation with the audience of the service. However, the building was vacated in 2012 as a result of the Broadcasting House changes and the end of the building's lease that year; the first service to move was the Burmese Service on 11 March 2012 and the final broadcast from Bush House was a news bulletin broadcast at 11.00GMT on 12 July 2012. The BBC World Service encompasses an English 24-hour global radio network and separate services in 27 other languages. News and information is available in these languages on the BBC website, with many having RSS feeds and specific versions for use on mobile devices, and some also offer email notification of stories. In addition to the English service, 18 of the language services broadcast a radio service using the short wave, AM or FM bands. These are also available to listen live or can be listened to later (usually for seven days) over the Internet and, in the case of seven language services, can be downloaded as podcasts. News is also available from the BBC News 'app', which is available from both iTunes and the Google Play Store. In recent years, video content has also been used by the World Service: 16 language services show video reports on the website, and the Arabic and Persian services have their own television channels. TV is also used to broadcast the radio service, with local cable and satellite operators providing the English network (and occasionally some local language services) free to air. The English service is also available on digital radio in the UK and Europe. Traditionally, the Service relied on shortwave broadcasts, because of their ability to overcome barriers of censorship, distance, and spectrum scarcity. The BBC has maintained a worldwide network of shortwave relay stations since the 1940s, mainly in former British colonies. These cross-border broadcasts have also been used in special circumstances for emergency messages to British subjects abroad, such as the advice to evacuate Jordan during the Black September incidents of September 1970. These facilities were privatised in 1997 as Merlin Communications, and later acquired and operated as part of a wider network for multiple broadcasters by VT Communications (now part of Babcock International Group). It is also common for BBC programmes to air on Voice of America or ORF transmitters, while their programming is relayed by a station located inside the UK. However, since the 1980s, satellite distribution has made it possible for local stations to relay BBC programmes. The World Service aims to be "the world's best-known and most-respected voice in international broadcasting, thereby bringing benefit to the UK, the BBC, and to audiences around the world", while retaining a "balanced British view" of international developments. Like the rest of the BBC, the World Service is a Crown corporation of the UK Government. For the financial year 2011-12, it received £255.2 million. In addition to broadcasting, the Service also devotes resources to the BBC Learning English programme. This table lists the various language services operated by the BBC World Service with start and closure dates, where known/applicable. The World Service in English mainly broadcasts news and analysis. The mainstays of the current schedule are Newsday, World Update, Newshour and The Newsroom. There are daily science programmes: Health Check, the technology programme Click and Science in Action. At weekends, some of the schedule is taken up by Sportsworld, which often includes live commentary of Premier League football matches. Other weekend sport shows include The Sports Hour and Stumped, a cricket programme co-produced with All India Radio and the Australian Broadcasting Corporation. On Sundays the international, interdisciplinary discussion programme The Forum is broadcast. Outlook is a human interest programme presented by Matthew Bannister and Jo Fidgen, which was first broadcast in July 1966 and presented for more than thirty years by John Tidmarsh. Trending describes itself as "explaining the stories the world is sharing..." Regular music programmes were reintroduced with the autumn schedule in 2015. Many programmes, particularly speech-based ones, are also available as podcasts. Previous broadcasts included popular music programmes presented by the late John Peel and classical music programmes presented by the late Edward Greenfield. There have also been religious programmes, of mostly Anglican celebration and often from the Church of St. Martin in the Fields, weekly drama, English-language lessons, and comedy including Just A Minute. Other notable previous programmes include Letter from America by Alistair Cooke, which was broadcast for over fifty years; Off the Shelf with its daily reading from a novel, biography or history book; A Jolly Good Show, a music request programme presented by Dave Lee Travis; Waveguide, a radio reception guide; and The Merchant Navy Programme, a show for seafarers presented by Malcolm Billings. Since the late 1990s, the station has focused more on news, with bulletins added every half-hour following the outbreak of the Iraq War. News is at the core of the scheduling. A five-minute bulletin is generally transmitted at 01 past the hour, with a two-minute summary at 30 past the hour. Sometimes these are separate from other programming, or alternatively made integral to the programme (such as with The Newsroom, Newshour or Newsday). During such time slots as weeknights 11pm-12am GMT and that of Sportsworld, no news summaries are broadcast. As part of the BBC's policy for breaking news, the Service is the first to receive a full report for foreign news. The station also publishes a Global News podcast twice a day (once on weekends), of around 30 minutes. The podcast is comparable to an edition of The Newsroom but without the five-minute reading of the news. Between 2007 and 2015 it was downloaded more than 300 million times. The BBC World Service in English employs a team of seven announcers and newsreaders. The BBC World Service website lists more than 80 FM stations in Africa which broadcast BBC content. The BBC World Service broadcasts a few hours in the morning and evening on shortwave to Africa from Ascension Island, Mauritius, South Africa, the UK, Madagascar and the UAE. Broadcasts have traditionally come from the UK, Cyprus, the large BBC Atlantic Relay Station on Ascension Island, and the smaller Lesotho Relay Station and Indian Ocean Relay Station on Seychelles. A large part of the English schedule is taken up by specialist programming from and for Africa, for example Focus on Africa and Africa, Have Your Say. In the 1990s, the BBC added FM facilities in many African capital cities. BBC World Service is available by subscription to Sirius XM's satellite radio service in the United States. Its Canadian affiliate, Sirius XM Canada does the same in Canada. More than 300 public radio stations across the US carry World Service news broadcasts —mostly during the overnight and early-morning hours— over AM and FM radio, distributed by American Public Media (APM).. The BBC and Public Radio International (PRI) co-produce the programme The World with WGBH Radio Boston, and the BBC was previously involved with The Takeaway morning news programme based at WNYC in New York City. BBC World Service programming also airs as part of CBC Radio One's CBC Radio Overnight schedule in Canada. For several decades, the World Service's largest audiences have been in Asia, the Middle East, Near East and South Asia. Transmission facilities in the UK and Cyprus were supplemented by the former BBC Eastern Relay Station in Oman and the Far Eastern Relay Station in Singapore, formerly in Malaysia. The East Asian Relay Station moved to Thailand in 1997 when Hong Kong was handed over to Chinese sovereignty. The relay station in Thailand was closed in January 2017; currently, relay stations in Singapore and Oman serves the Asian region. Together, these facilities have given the BBC World Service an easily accessible signal in regions where shortwave listening has traditionally been popular. The English shortwave frequencies of 6.195 (41m band), 9.74 (31m band), 15.31/15.36 (19m band) and 17.76/17.79 (16m band) MHz were widely known. On 25 March 2018, the long-established shortwave frequency of 9.740 MHz was changed to 9.900 MHz. The largest audiences are in English, Hindi, Urdu, Nepali, Bengali, Sinhala, Tamil, Marathi and other major languages of South Asia, where BBC broadcasters are household names. The Persian service is the de facto national broadcaster of Afghanistan, along with its Iranian audience. The World Service is available up to eighteen hours a day in English across most parts of Asia, and in Arabic for the Middle East. With the addition of relays in Afghanistan and Iraq these services are accessible in most of the Middle and Near East in the evening. In Singapore, the BBC World Service in English is essentially treated as a domestic broadcaster, easily available 24/7 through long-term agreement with MediaCorp Radio. For many years Radio Television Hong Kong broadcast BBC World Service 24/7 but as of 4 September 2017 only broadcasts the station at night. In the Philippines, DZRJ 810 AM broadcasts the BBC World Service in English from 12:00–05:00 PHT (GMT+8). Japan and Korea have little tradition of World Service listening, although during the 1970s to 1980s, shortwave listening was popular in Japan. In those two countries, the BBC World Service was only available via shortwave and the Internet. As of September 2007, a satellite transmission (subscription required) became available by Skylife (Channel 791) in South Korea. In November 2016, the BBC World Service announced it plans to start broadcasts in Korean. BBC Korean, a radio and web service, started on 25 September 2017. The BBC World Service is broadcast in Berlin on 94.8 MHz. FM relays are also available in Ceske Budjovice, Karlovy Vary, Plzen Usti nad Labem, Zlin and Prague in the Czech Republic, Riga, Tirana and Vilnius. A BBC World Service channel is available on DAB+ in Brussels and Flanders and Amsterdam, the Hague, Utrecht and Rotterdam. Following a national reorganisation of DAB multiplexes in October 2017, the station is available on DAB+ across the whole of Denmark . The World Service employed a medium wave transmitter at Orfordness to provide English-language coverage to Europe, including on the frequency 648 kHz (which could be heard in parts of the south-east of England during the day and most of the UK after dark). Transmissions on this frequency were stopped on 27 March 2011, as a consequence of the budgetary constraints imposed on the BBC World Service in the 2010 budget review. A second channel (1296 kHz) traditionally broadcast in various Central European languages, but this frequency has also been discontinued and in 2005 it began regular English-language transmissions via the Digital Radio Mondiale (DRM) format. This is a digital shortwave technology that VT expects to become the standard for cross-border transmissions in developed countries. The BBC World Service still goes out from the BBC Radio 4 LW & MW transmitters from 01:00am to 05:20am UK Time and is in stereo from 01:00am to 05:20am on BBC Radio 4 FM & DAB. It has always been in mono on its own DAB channel with a bit rate of just 64 kbit/s. BBC World Service can also be heard on BBC Radio Wales from 01:00am until 05:30am on MW and FM stereo. The World Service is available as part of the subscription Digital Air package (available from Foxtel and Austar) in Australia. ABC NewsRadio, SBS Radio, and various community radio stations also broadcast many programmes. Many of these stations broadcast a straight feed during the midnight to dawn period. It is also available via the satellite service Optus Aurora, which is encrypted but available without subscription. In Sydney, Australia a transmission of the service can be received at 152.025 MHz. It is also available on the DAB+ Network in Australia on SBS Radio 4 (Except during Eurovision and special events). 2MBS-FM 102.5, a classical music station in Sydney, also carries the BBC World Service news programmes at 7 and 8a.m. on weekdays, during its 'Music for a New Day' breakfast programme. The tune Lillibullero was another well known signature tune of the network following its broadcast previously as part of the top-of-the-hour sequence. This piece of music is no longer heard before news bulletins. The use of the tune gained minor controversy because of its background as a Protestant marching song in Northern Ireland. ^ "BBC's combined global audience revealed at 308 million". BBC. 2015-05-15. Retrieved 2016-02-13. ^ Conlan, Tara (23 November 2015). "BBC World Service to receive £289m from government" – via The Guardian. ^ "BBC World Service (BBCWS), The UK's Voice around the World". BBC. Archived from the original on 1 November 2006. ^ "About Us: BBC World Service". British Foreign & Commonwealth Office. 22 October 2010. Retrieved 9 January 2011. ^ "BBC - Mary Hockaday, Controller, World Service English - Inside the BBC". www.bbc.co.uk. Retrieved 2017-07-28. ^ Repa, Jan (25 October 2005). "Analysis: BBC's voice in Europe". BBC News. Retrieved 16 July 2012. ^ a b "Historic moments from the 1930s". BBC World Service. Retrieved 16 July 2012. ^ West, W. J., ed. (1985). Orwell: The War Broadcasts. Duckworth & Co/BBC. ISBN 0-563-20327-7. ^ West, W. J., ed. (1985). Orwell: The War Commentaries. Duckworth & Co/BBC. ISBN 978-0-563-20349-0. ^ "Historic moments from the 1940s". BBC World Service. Retrieved 16 July 2012. ^ "The 1960s". BBC World Service. Retrieved 25 April 2010. ^ "BBC East Europe voices silenced". BBC News. 21 December 2005. Retrieved 18 July 2012. Announcing the cuts in October, the director of the BBC World Service, Nigel Chapman, said that the European services were a beacon of free and independent information during the Cold War, but were now in decline. ^ "BBC shuts down Romanian service". bbc.co.uk. BBC. 25 June 2008. Retrieved 29 July 2017. The BBC World Service is to close its Romanian language service, after 69 years of broadcasting. Transmissions in Romanian will cease on 1 August. ^ "BBC World Service to cut five language services". BBC News. 26 January 2011. Retrieved 18 July 2012. ^ "BBC World Service cuts outlined to staff". BBC News. 26 January 2011. Retrieved 18 July 2012. ^ Plunkett, John (26 January 2011). "BBC World Service to 'cut up to 650 jobs'". The Guardian. Retrieved 18 July 2012. ^ a b Thomas, Ronan. "BBC Broadcasting House". West End at War.org.uk. Retrieved 18 July 2012. ^ a b c "Why is the HQ called Bush House?". Frequently Asked Questions. BBC World Service. Retrieved 18 July 2012. ^ "BBC Buildings – Bush House". The BBC Story. BBC. Retrieved 18 July 2012. ^ a b "BBC World Service leaves Bush House". BBC News. 12 July 2012. Retrieved 18 July 2012. ^ "New Broadcasting House comes alive". News and Events. BBC. Retrieved 18 July 2012. ^ "Bush House: BBC World Service moves home". BBC News. 12 July 2012. Retrieved 18 July 2012. ^ Higham, Nick (12 July 2012). "BBC World Service leaves Bush House". BBC News. Retrieved 18 July 2012. ^ Sabbagh, Dan (12 July 2012). "Bush House ceases BBC broadcasts after 71 years". The Guardian. Retrieved 18 July 2012. ^ "BBC Radio news". Google. ^ a b "BBC News in Languages". BBC. Retrieved 18 July 2012. ^ "How and When to Listen". BBC World Service. Retrieved 18 July 2012. ^ "Annual Review 2008/2009". BBC News. Retrieved 8 April 2010. ^ "Annual Review 2011/12" (PDF). BBC World Service. p. 9. Retrieved 18 July 2012. ^ "BBC Learning English". BBC. Retrieved 3 October 2008. ^ "BBC man quits after claims he helped to topple president in Kyrgyzstan revolt". Standard.co.uk. 7 April 2011. ^ "BBC newsreader fired following confirmation of his involvement into the April 2010 revolution in Kyrgyzstan". Ferghana.news. 28 April 2017. ^ "75 Years – BBC World Service | Multi-lingual audio | BBC World Service". BBC. Retrieved 16 February 2011. ^ History of International Broadcasting (IEEE), Volume I. ^ ""BBC World Service Europe"". Archived from the original on 23 January 1998. Retrieved 2013-04-17. CS1 maint: BOT: original-url status unknown (link). BBC. 23 January 1998. Retrieved 17 April 2013. "Unfortunately, the Finnish Service was closed on the 31st December 1997." ^ Kremer, Guntram. ""Epilog"". Archived from the original on 22 April 1999. Retrieved 2013-04-17. CS1 maint: BOT: original-url status unknown (link) . BBC World Service German. 22 April 1999. Retrieved 17 April 2013. "G.K. Der Deutsche Dienst der BBC wurde am 26 März 1999 geschlossen." ^ a b "BBC Igbo and Yoruba launched in Nigeria". 19 February 2018 – via www.bbc.com. ^ "A fond farewell to BBC Serbian". BBC News. 26 February 2011. ^ "BBC launches first social media-only news service – for Thailand". Retrieved 13 October 2014. ^ "BBC WORLD SERVICE AND XM ANNOUNCE PROGRAMMING ALLIANCE" (Press release). XM Satellite Radio. 26 July 1999. Archived from the original on 11 November 2006. Retrieved 17 October 2007. ^ "BBC World Service Appoints American Public Media as New Distributor in the United States". APM. 12 July 2012. Archived from the original on 26 January 2013. Retrieved 2 January 2013. ^ "BBC World Service | FAQ". BBC. 10 August 2005. Retrieved 16 February 2011. ^ "Save the BBC World Service in North America and the Pacific! – BBC to Cut Off 1.2 Million Listeners on July 1". Savebbc.org. 6 June 2001. Archived from the original on 30 November 2010. Retrieved 16 February 2011. ^ "FAQ | World Service". BBC. Retrieved 16 February 2011. ^ "Press Office – Falkland Islands and BBC to boost home-grown media". BBC. 23 February 2006. Retrieved 16 February 2011. ^ Clare Harkey (13 March 2006). "BBC Thai service ends broadcasts". BBC News. Retrieved 8 November 2008. ^ Vivien Marsh (28 March 2011). "BBC Chinese Service makes final broadcast in Mandarin". BBC. Retrieved 25 October 2011. ^ Williams, Martyn (26 September 2017). "Option for North Korean Radio Listeners". 38 North. U.S.-Korea Institute, Johns Hopkins University School of Advanced International Studies. Retrieved 28 September 2017. ^ Vivien Marsh (28 March 2011). "BBC Chinese Service makes final broadcast in Mandarin". BBC. Retrieved 13 March 2014. ^ Ben Dowell (20 March 2011). "BBC World Service to sign funding deal with US state department". The Guardian. Retrieved 13 March 2014. ^ "Press Office – Uzbek language broadcasts jammed". BBC. Retrieved 15 March 2014. ^ a b "House of Commons – Foreign Affairs: Written evidence from the BBC World Service". Publications.parliament.uk. Retrieved 15 March 2014. ^ John Plunkett. "BBC condemns China's 'deliberate' jamming of World Service broadcasts | Media". theguardian.com. Retrieved 15 March 2014. ^ "BBC World Service joins new Danish DAB+ network". Retrieved 2 October 2017. ^ "BBC World Service: The closure of 648 kHz medium wave". BBC. Retrieved 11 August 2012. ^ "BBC Launches DRM Service in Europe". BBC World Service. 7 September 2005. Retrieved 15 November 2006. ^ "Friends". worldservice.co.nz. Auckland Radio Trust. Retrieved 23 January 2016. ^ "Home Page". worldservice.co.nz. Auckland Radio Trust. Retrieved 23 January 2016. ^ a b c "What is the BBC World Service signature tune?". BBC. Retrieved 4 September 2010. ^ a b c Robert Weedon (16 December 2009). "Audio Identities". Retrieved 4 September 2010.